I can't believe I am saying this, but I have actually found a natural deodorant that works!! 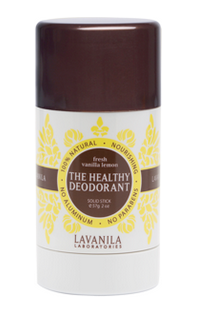 For YEARS I have been on the hunt for a deodorant that was not only natural and aluminum free, but actually kept my armpits dry and smelling nice. Before this, the most satisfied I had ever been with a natural deodorant was one that I made myself out of coconut oil and baking soda. It worked well for me in the winter, but not so much in the summer months. I was skeptical about this one at first. Well once you have tried nearly every natural deodorant under the sun (including homemade!) you are bound to be doubtful I guess. 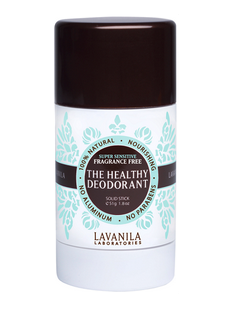 Lavanila makes aluminum and paraben free deodorants that are 100% natural. They have many different scents too! 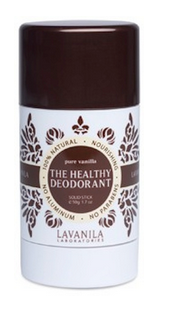 I discovered this at Sephora (the last place I thought I would find a natural deodorant! ), and they only had the pure vanilla scent (and only in the travel size). I will be purchasing another full sized deodorant as soon as I am out of this one. I really want to give the vanilla/coconut one a try. They also carry an unscented one as well. The only downside of this deodorant is the smell is a little more "powdery" than I am used to. Granted I have only tried the one scent, so I can't really comment on the others. It really isn't that bad though. If you are sensitive to scents I would give the unscented one a try over the pure vanilla. The price point is quite high for a deodorant at $14 each, but honestly I am just so blown away that I finally found a natural one that works, I don't mind spending a bit extra on one that I can feel good about. 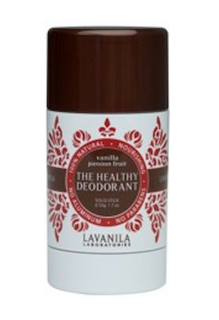 Click here to head over to Lavanila's online shop. Has anyone else tried this deodorant? Or do you have another favourite natural one that works for you? Let me know in the comments below!